I have to admit the aquarium got very close to zero attention but that only because it is running so well and independently. A well settled system which was nice to see as I havent changed the water for well over 6 months, only topups, light cleaning of decaying seaweed (Sugar Kelp), Skimmer cleaning and sporadic feeding. The Codium Fragile is to my massive delight now growing literally everywhere. It came from nowhere and started in only a few spots first. 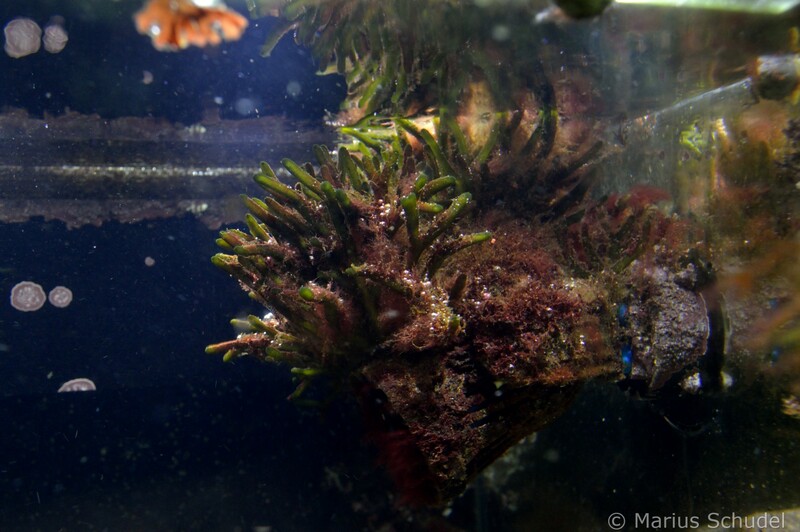 Now it has nearly taken over the tank but its being overtaken now in September by lots of red hair algae. The red hair algae came back as expected with longer days and warmer water but it is in check. All female prawns have been carrying eggs and seem desperate to shed their shells after releasing their larvae since seaweeds are starting to grow on their shell! A newish species in the tank is 4 Connemara Clingfishes Lepadogaster Candollei. These are much larger (2-6cm) than the one I had previously and seem to have adapted to tank live and food very well. I have to say they are now one of my favourite species to keep as they are so entertaining to watch, very rarely free swimming but very comical as they move their heads and eyes in different directions. Not sure how destructive they will become but so far so good. They can change their coloration quite considerably too from pale yellowbrown to dark grey. Their akward shape and way of clinging themselves sometimes upside down onto structure is very interesting to watch. 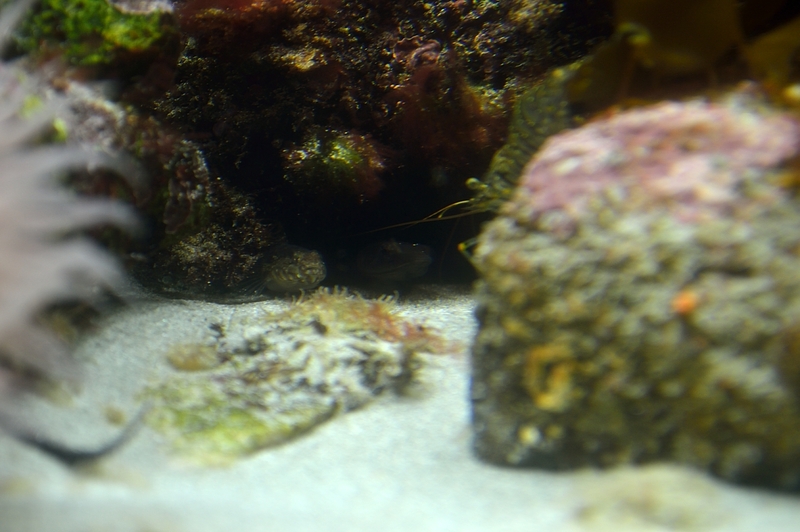 The Rock Gobies have overgrown the tank and where returned last week. They were also starting to get territorial and the bigger one (9cm) was chasing the smaller one. I have never seen them going so extremely black as in picture below before (the smaller one) which is why I held on to them for so long, it looked so cool. A Tomplot Blenny is now the master of the 120l predator tank as I couldnt keep such an extremely voracious creature with anybody else 😉 I think he is quite happy there and always has a stuffed belly. The pictures are from April but he is now around 11cm from 5cm! Very interesting as all blennies but has to be kept in check as they will try to eat anything even if it doesnt fit in their mouth! 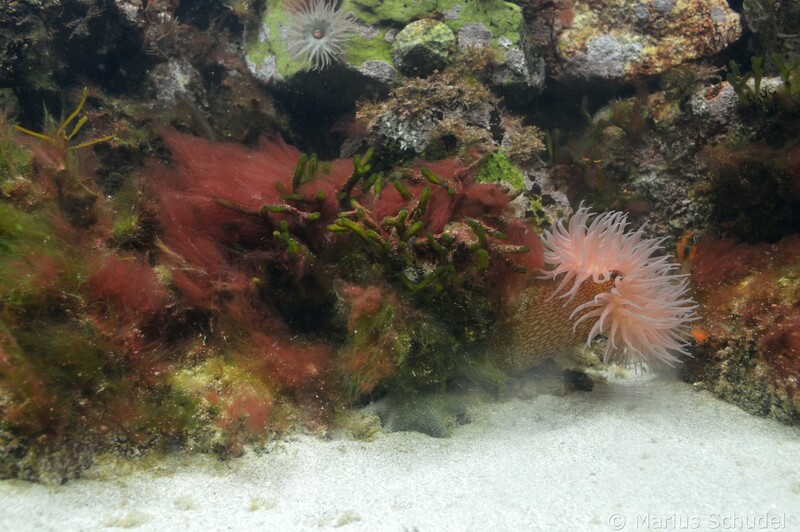 A very welcome reappearance during a nighttime peek into tank was the Aeolidiella sanguinea. This Nudibranch is now in the tank since November 2013, and boy has it grown! 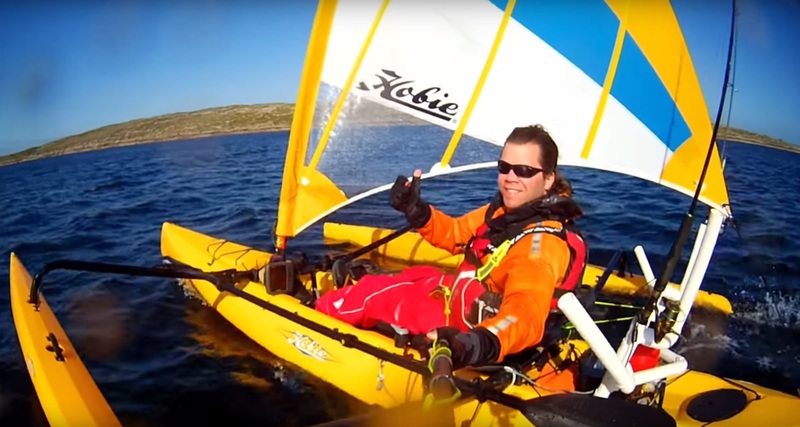 This is why this hobby is so exciting! During a sandeel netting session last week a very unexpected surprise showed up in the net. One of my favourite deepwater species, a Tub Gurnard. Its only around 7cm so there was no doubt that it has found a new home 🙂 Absolutely delighted however it hasnt been accepting my food yet so will have to see how it goes. Really cool to watch, I never knew that their “legs” are actually used for walking, I always thought its only for sensing food in the sand but they use it as their only means of propulsion for cruising on the seabed. Will hopefully get to make a video of it. So far its mostly fairly shy and burying in the sand a lot but also goes on free swimming exploration tours. October 7, 2015 in 120l Predator Tank, 200l Main tank. Nice tank – I envy your Tub Gurnard, nice blue fin colours. How do you catch sandeels? Cheers, yeah its beautiful, I was shouting with joy when I saw it in the net 🙂 I think I was really lucky to catch the Gurnard, they are deepwater species and we caught him in only 1m of water on the edge of a beach. The tides where very extreme here with the supermoon maybe thats why he was so high up. We catch sandeel with a 12×1.5m net like this one . the bottom has weights on it and the top has floats, we attach the bottom sides to our feet which means it drags over the sand when we pull the net and spooks the sandeel out of the sand, its great to do it when it works and you end up with 100 Sandeels in the net at times 🙂 we just catch them for fishing bait. We where dragging it close to the rocks on the edge of the beach which I think is where the Gurnard was. Nice net, a bit bigger than I expected, where do you buy such nets? Very cool that the tank and its inhabitants are doing so well still. The Tub gurnard is a stunner, and so is the nudibranch. I have seen some little cushion stars in my tank but definitely to the extent that you do. 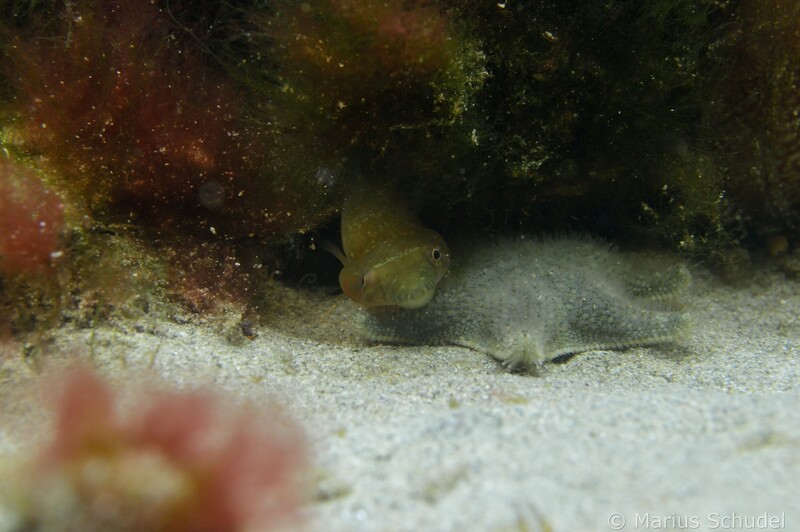 How are the clingfish behaving? 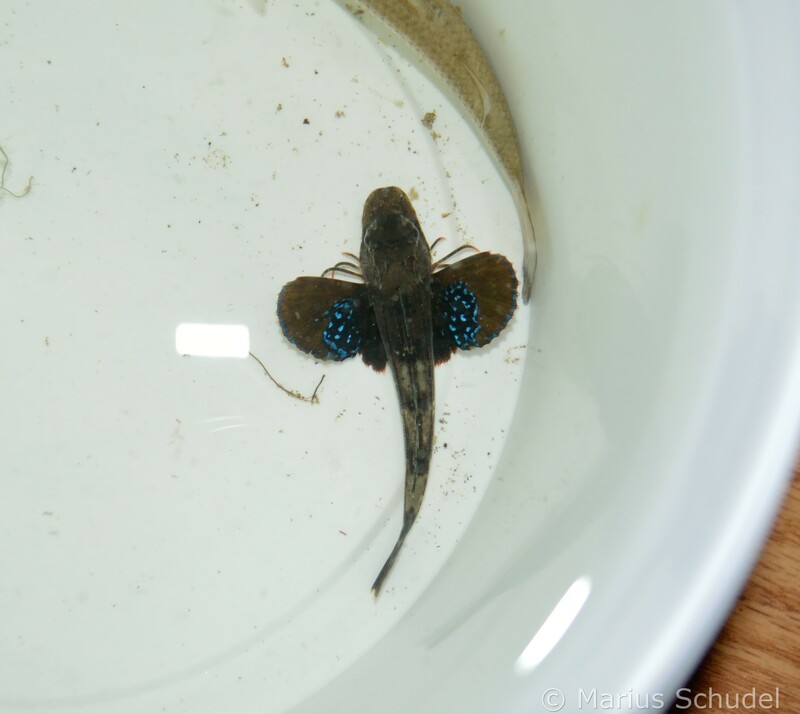 I had a different species (Lepadogaster lepadogaster) once but it just hid under a rock all the time. How often do you see the Connemara ones? I have caught them here so it might be a nice option. I will remove my tompot; it is a fun fish, but it does not go together with anemones and I do not like my aquarium without them. One last thing, I am playing around with a small tropical aquarium on my work desk now and also have an algae problem. I found this interesting discussion and will try H2O2 to get rid of it…maybe something you could also try with the red algae? Hi Mick, hope you get some more cushionstars to come through, they are so helpful. The clingfishes are very interesting, they hide a good bit in daylight but are out and about especially when food is around and are investigating any commotion thats going on. I think they are very suitable and I would definitely give them a try. Yeah I can only keep the tompot as he is in a separate tank. Does it eat your anemones?? Thanks a lot for the link I will definitely look into it but it will probably destroy ANY life on it? Its not my own net so not too sure but they sometimes also called Seine nets. this looks pretty much like it. dont go for monofilament ones, they are much harder to handle, if you scroll dwon on the link this looks exactly like what we have used. Terrific update! I love the clingfish and the tompot blenny. 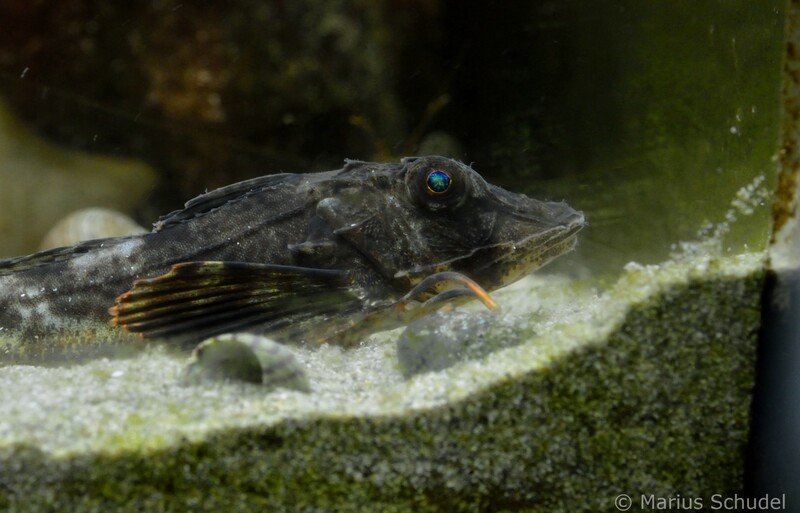 Although my tank will have some pretty cool blennies if all goes well, I’m extremely jealous that you all can collect tompot blennies. They are so cool! I will have to live through you to observe them 😉 We have clingfish, locally called “skilletfish”, Gobiesox strumosus. I had one many years ago and look forward to keeping them again. They have a ton of personality and are quite unique. I’m happy to hear others appreciate them! I can’t wait for the next update! Wow, that would be a cool species tank for the Tompot. Can you breed them? Can you keep more than one? What size tank, if so? I think that they’re pretty stunning! Hopefully I will have it set up this winter and stocked by May. I hope to stock several Striped Blennies (Chasmodes bosquianus) and maybe a single Feather Blenny (Hypsoblennius hentz). Those are the two that are found primarily. I plan to have several clingfish, of course, and also any gobies that I can collect. Others in my list include the Hogchoker (a flatfish) and perhaps a few of the topminnow species found locally. If I’m lucky enough to collect a spotfin butterflyfish that strays a bit north, then I’d be on top of the world! I will send you my RC link once I make progress. Looking forward to your next update! I dont know how they breed to be honest and I think it could cause some issues as they are extremely territorial and voracious. If you have a 300+ tank with lots of hiding places it might be possible to keep more than one. 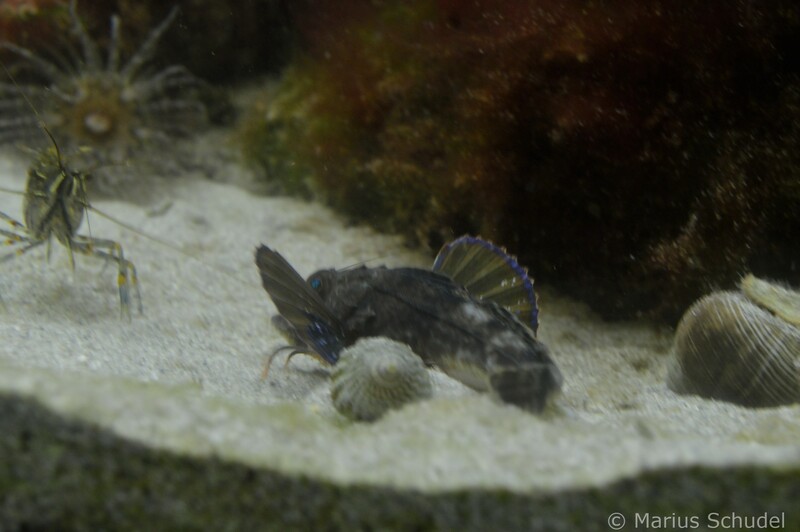 I had very small blennies in my 200l and they kept chasing each other. 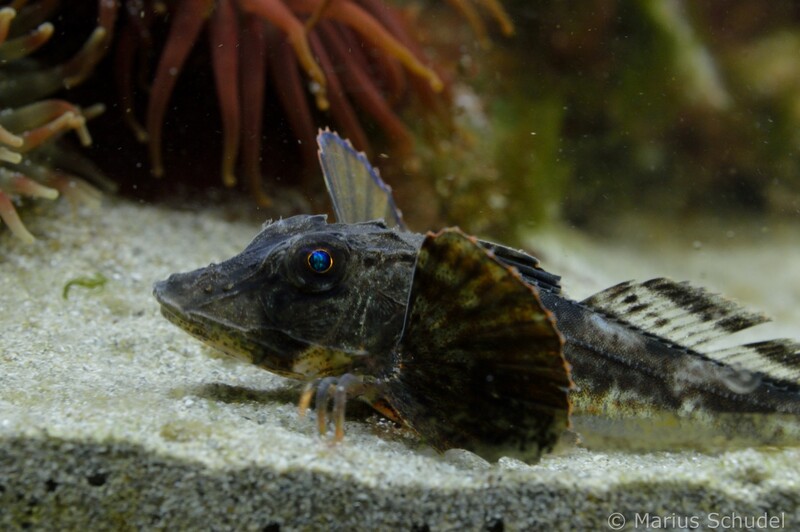 I wouldnt go too overboard with blennies they will eat all your hermits and snails and litterally everything thats fits in they mouths 😉 unless you want a blennie theme tank that would be very cool as they are extremely entertaining to watch. Good luck with the build and hope you find that butterflyfish, looks deadly! Yeah and send me the link once you have it setup. 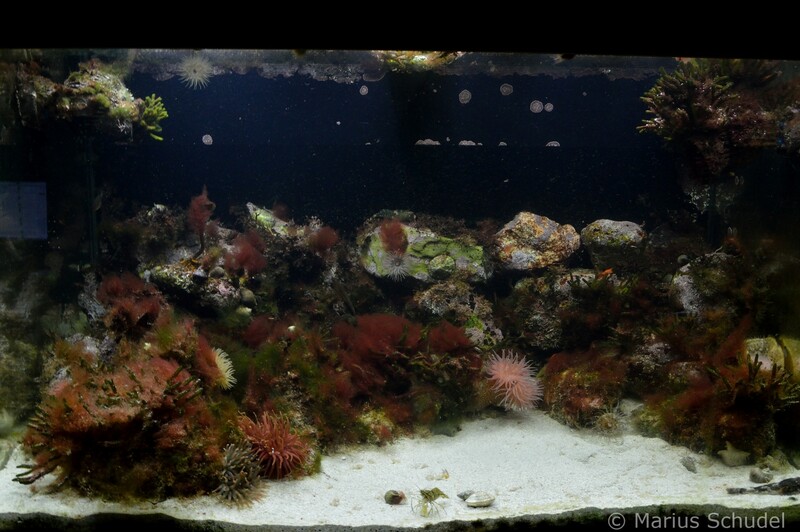 I am not doing much with my own tank at the moment, dying to get out and collect some new stuff but I am moving some time early next year and then I will completely overhaul the system and build walls on the sides and background to get more structure and more of a rockpool-look. will be using the DIY liverock technique so it will be quite porous and with caves and stuff so i can also keep more animals since there is more hiding places.